Anyone weary of the substantial portion of summer blockbusters based on comic books should note one of the worst trends that this one supplanted: For a time in the ’90s, a substantial portion of summer movies was based on old TV shows. The 1987 action-comedy version of Dragnet was one of the earliest attempts to turn a rerun staple into a big summer-season popcorn movie, which alone would probably be enough to assure its general condemnation. But on top of its status as the pioneer of a dubious field, Dragnet very much follows the modern blockbuster blueprint of adaptation. Something square and simple is updated into a big, jokey movie straining to please a broad, car-crash-craving audience. In particular, this movie’s climactic stretch is bigger and louder than anything ever attempted on the Dragnet TV show, complete with sidekick Tom Hanks hollering a half-idiotic, half-hilarious pun of a catchphrase. And yet, “half-hilarious” is key here. The movie sports a killer central conceit: The steadfast and straightlaced monotone of Sergeant Joe Friday (Jack Webb on the original series) lives on in contemporary (which is to say 1987) Los Angeles via his same-named nephew (Dan Aykroyd). The Brady Bunch Movie (1995) trades on a similar combination of killer impressions and fish-out-of-water silliness, but Aykroyd’s performance goes beyond mere winking homage into another, more fastidious realm. As it turns out, Joe Friday is a role the motormouthed Aykroyd was born to play, and Dragnet is one of the few films that uses the details of his idiosyncratic comic madness. Friday is paired with the delightfully named Detective Pep Streebeck (Tom Hanks), and the mismatched partners investigate a nefarious cult. The case mixes Dragnet investigative boilerplate with more elaborate trappings: car crashes, snake attacks, shoot-outs, and unlikely conspiracies. Frankly, the boilerplate is more fun, as Friday attempts to maintain order via moral uprightness and breathless recitations of the penal code. But there’s a loopy novelty to seeing the Dragnet formula reconfigured for action, even if the action itself isn’t especially thrilling. Director Tom Mankiewicz was an old hand at ongoing pop-culture characters, having scripted several James Bond films, directed episodes of Hart To Hart, and worked on Richard Donner’s Superman movies. (His other feature film, the negligible non-blockbuster comedy Delirious, was also TV-centric, starring John Candy as a writer of soap operas.) 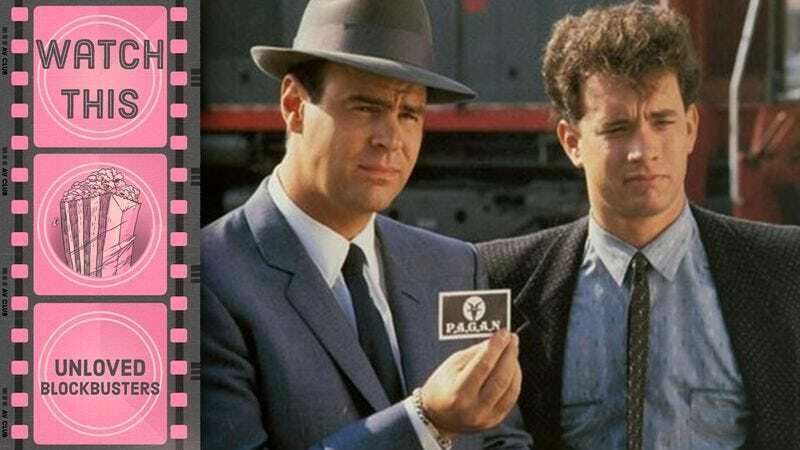 Mankiewicz co-wrote Dragnet along with Aykroyd and SNL writer Alan Zweibel, and when the screenplay isn’t pandering to the traditions of the time, it plays to the strengths of both Aykroyd and loose, pre-prestige Hanks. Not all of Streebeck’s wisecracks land, but Hanks does a terrific job of conveying his fascination with Friday alongside his irritation. He and Aykroyd must go through the buddy-cop motions (which includes some less productive time apart), but Dragnet has more than enough deadpan spoofiness to set it apart. Decades later, it’s a would-be blockbuster as time capsule, and not just for its occasionally wailing sax, its terrible update of the Dragnet theme (complete with Hanks hollering out some Beastie Boys-style rapping), and Dabney Coleman’s supporting role. It also evokes a curious, magical time when Dan Aykroyd could be billed above Tom Hanks. Availability: Dragnet is available on DVD from Netflix or possibly your local video store/library. It’s also available for rental or purchase from the major digital outlets.